Monday: The Penguins have officially announced the contract. Sunday: The Pittsburgh Penguins have signed a recent draft pick to his entry-level contract. Whispers emerged early last month that 2017 fifth-round choice Jan Drozg, a right wing for the QMJHL’s Shawinigan Cataractes, was close to signing his rookie deal with Pittsburgh, but it was unclear whether the pact would begin this year or next. CapFriendly reports that the three-year deal has been completed and it does in fact begin with the 2019-20 season. The Penguins have yet to confirm the signing. Drozg’s ELC carries an AAV of $925K, but a base salary of just $700K in the first two years and $750K in the final year. The young forward, who turns 20 next month, will be supplemented by a $278K signing bonus, as well as performance bonuses of up to $132,500 in the first two seasons and $82,500 in the final season. Of course, none of this is guaranteed to begin next season, as Drozg has a year of junior eligibility remaining and could be a candidate for an entry-level slide next year if the Penguins decide they would prefer for him to return to the QMJHL. Drozg, who stands tall but slight at 6’2″ and 174 pounds, became just the seventh Slovenian player drafted and the highest selection outside of Anze Kopitar when the Penguins took him 152nd overall in 2017 out of the Swedish junior ranks. A fast, hard-working forward, Drozg is omnipresent on the ice and helps to create a lot of offense for the Cataractes, a team that lacks much game-breaking talent. Last season, Drozg made the jump to North America after being selected by Shawinigan in the first round of the CHL Import Draft and immediately made his presence felt, leading the team with 50 points in 61 games. The effort even earned him a tryout game with the AHL’s Wilkes-Barre/Scranton Penguins, in which he notched an assist. Drozg has outdone himself this year, scoring at a point-per-game pace to again lead the Cataractes with 52 points in 53 games thus far. Making Drozg’s accomplishments more impressive is the fact that Shawinigan has been arguably the worst team in the QMJHL over the past two years and Drozg’s offensive potential has a much higher ceiling once he is surrounded by superior talent. As such, the Penguins could opt to start Drozg in the AHL next season rather than return him to junior, as putting him in a competent lineup may be the best thing for the young winger’s development. If he can continue to produce consistently at the pro level as he has in junior, Pittsburgh may have found a diamond in the rough in the late-round forward. Due to the limits on selections by team, both in the initial rosters and the “Last Man In” vote, there are several star players who cannot be saved by fan voting this year. The Toronto Maple Leafs’ Mitch Marner, the No. 6-ranked scorer in the league, highlights the snub group, which also includes Calgary Flames forwards Sean Monahan and Matthew Tkachuk, Pittsburgh Penguins forwards Evgeni Malkin and Phil Kessel, and Minnesota Wild defenseman Ryan Suter. Other odd omissions, not necessarily forced by the format, are Columbus’ Artemi Panarin, Nashville’s Ryan Johansen, and Montreal’s Max Domi and Jeff Petry. However, the new final vote option does largely do a good job of giving each team and their fan base one last chance to get a deserving player into the All-Star game. When one national writer connects a contending team with a trade candidate, it’s simply speculation. When three link the two in the span of a few days, there is usually something to it. Sportsnet’s Elliotte Friedman suggested that the Boston Bruins could be a possible destination for Los Angeles Kings veteran center Jeff Carter in his latest “31 Thoughts” segment. The same day, The Athletic’s Fluto Shinzawa published an entire piece on Carter’s ideal fit in Boston. His colleague, Craig Custance, also wrote about how the best blueprint for a rebuild in L.A. could be to emulate the Bruins, who recouped picks and young players in 2015 by trading away Milan Lucic and Dougie Hamilton, but largely leaving their core intact. This time around, could Carter be in Lucic’s shoes with the Bruins and Kings swapping roles? It’s looking like a real possibility. The logic behind a Carter deal is obvious for the Kings. L.A. sits in last place in the NHL, with just 24 points through 33 games. The team is far older than they would like to be given their struggles and, as Custance suggests, would benefit greatly from moving out a handful of veterans to inject youth and potential into the roster along with a solid core of Anze Kopitar, Drew Doughty, and Jonathan Quick. It is no surprise that TSN’s most recent Trade Bait list features Kings defenseman Jake Muzzin at No. 2, Carter at No. 5, and Alec Martinez at No. 16. Although Carter, still a capable offensive player, has three years remaining on his contract beyond this season at a remarkably reasonable $5.27MM cap hit and even lower salary, he is also 33 years old and is unlikely to improve in the years it could take for L.A. to return to the postseason. The Kings would be able to add some impressive young pieces in exchange for Carter, kick-starting their rebuild. TSN’s Frank Servalli warns that Carter could use the threat of retirement to decide on his destination, but he would be unlikely to turn down the opportunity to end his career with a contender like Boston. However, does the deal make sense for the Bruins? Obviously, the first aspect worth noting is Boston’s depth down the middle. Patrice Bergeron and David Krejci, while aging themselves, are still playing at an elite level and are both signed long-term. Adding Carter would give the Bruins three centers age 32 or older signed through at least the 2020-21 season. The Bruins would have the gauge the asking price on Carter against the fact that he would most likely be their third-line center. Yet, this alone doesn’t rule out a Carter trade. Shinzawa notes that Jakob Forsbacka Karlsson, while improving, is not yet ready for prime time match-ups as the anchor of his own line. Carter would be a very helpful addition in the short-term, especially as the Bruins square off against the Toronto Maple Leafs and Tampa Bay Lightning and their equally impressive depth down the middle. Carter playing alongside a young winger like Ryan Donato or Danton Heinen could be a dangerous combo this season and beyond. If and when Forsbacka Karlsson – or Trent Frederic, Jack Studnicka, or Jakub Lauko – looks ready to take on a regular role over the next few years, the right-shooting Carter could also slide to the wing, where the Bruins have yet to identify a long-term option next to Krejci and Jake DeBrusk. The Bruins could find a way to make a talent like Carter’s work, but the cost will likely dictate whether or not a deal gets done. If Carter is playing the Lucic role in Custance’s proposed role reversal, the Kings would likely land a strong if unspectacular return. Lucic had just one year remaining on his contract as opposed to Carter’s three, but was younger and healthier and expected to play a top-line role in L.A. The Bruins received a first-round pick, established backup goaltender Martin Jones (who they flipped to San Jose), and standout AHL defenseman Colin Miller in exchange for Lucic. The Kings don’t need a young goaltender, nor do the Bruins have much to offer in that department. Boston will also be hesitant to move a first-round pick after forfeiting that pick last year in the Rick Nash trade. However, the Kings need scoring and the Bruins have a plethora of young forwards. Heinen could fill the Jones role of an established young NHLer, although the Kings could instead ask for Donato or Anders Bjork, while one of the team’s prospect centers could be substituted for the first-rounder and Jeremy Lauzon or Jakub Zboril could play the part of Miller. Anything more than that package of three talented young players would probably be a deal-breaker for GM Don Sweeney and company, but it’s not out of the realm of possibility that the combination gets a deal done. With a seemingly sensible fit on both sides and several major pundits pedaling the rumor, this isn’t the last of Carter-to-Boston speculation. However, the Bruins have also been linked to Carter’s teammate Tyler Toffoli, the Minnesota Wild’s Charlie Coyle, and the New York Rangers’ Kevin Hayes and Mats Zuccarello, yet no move has been made. There is no guarantee that Boston is looking to make a move right now, but as the season wears on these names will only continue to pop up until the Bruins inevitably make a move in pursuit of the Stanley Cup. As the holiday season approaches, PHR will take a look at what teams are thankful for as the season heads past the one-quarter mark. There also might be a few things your team would like down the road. 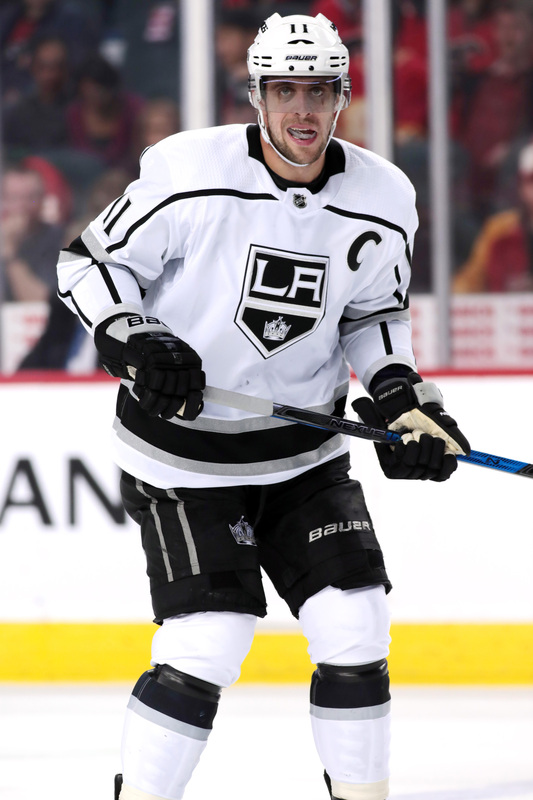 Let’s take a look at what’s gone well in the early going and what could improve as the season rolls on for the Los Angeles Kings. Click here for the other articles in this series. What are the Kings most thankful for? With a victory Saturday over division-rival Vegas and having split four of their last eight games, Los Angeles has pushed its way out of 31st place in the NHL. While that’s not necessarily something to be thankful for, the veteran-laden Kings started so badly that they were last in the NHL by far. However, the team has shown slight improvements since the team fired John Stevens and replaced him with Willie Desjardins on Nov. 4, who has a 7-10 record so far with the team. While that’s nothing great, the team has picked up a few key wins such as on Saturday and can only hope that things will be getting better on a daily basis. Who are the Kings most thankful for? With all the goaltending injuries that the team has sustained this season as both Jonathan Quick and backup Jack Campbell have missed large chunks of the season already, the team’s goaltending hasn’t been that bad. The team has been right in the middle, ranked 15th in save percentage with a .903, which is impressive considering their issues. In fact, the always reliable Quick has been the weakest link for the team in goal this year as he has a 3.23 GAA and a .893 save percentage in nine appearances, although it’s likely he’s not playing at 100 percent. The team should be impressed, however, with their success from their other goalies as Campbell fared quite well filling in for Quick initially before he went down with the same lower-body injury that Quick suffered. Campbell has posted a 2.33 GAA and a .923 save percentage in 13 games, while AHL prospect Calvin Petersen has fared equally as well with a 2.41 GAA and a .929 save percentage in nine games. What would the Kings be even more thankful for? Goal scoring. Team star Anze Kopitar, who is coming off a 35-goal, 92-point season last year, remains the team’s top scorer, but has just seven goals and 18 points — hardly numbers of a player who should be somewhere among the league leaders in scoring. In fact, the team’s lack of scoring can’t be placed on just one person as the entire team’s offense has been lethargic all season as other players including Jeff Carter, Dustin Brown and their big offseason acquisition Ilya Kovalchuk have all struggled this year. If Kopitar and some of the other veterans can pick up the pace a bit and start to show their value, the team could find the offense they need to move them from out of the bottom of the Pacific Division. What should be on the Kings’ Holiday Wish List? The team has brought in multiple youngsters to attempt to bring life to the team and while some of those players have had limited success such as Matt Luff, the Kings really need to shake up their roster and begin to reshape their franchise. While there have been plenty of rumors around about L.A. moving on from players like Jeff Carter or Tyler Toffoli, the team remains laden with multiple long-term deals that they are stuck with. If they can find any way to move one or two of them, they have to hope someone finds enough value in some of those veterans that they would be willing to take them off their hands. The Los Angeles Kings announced that general manager Rob Blake has relieved coach John Stevens of his duties. The Kings have made Willie Desjardins as the interim coach for the rest of the season. Despite picking up a 4-1 victory Saturday over the Columbus Blue Jackets, the victory didn’t do anything to allow Stevens to keep his job as the team remained 4-8-1 in the team’s first 13 games, giving them the worst record in league with the Florida Panthers the only other team that has nine points (although they have played two less games). Stevens, in just his second year as head coach of the team, took the team to the playoffs last year as the fourth-seed in the Pacific Division, but were swept in the first-round of the playoffs as the Vegas Golden Knights exposed their lack of speed. Los Angeles responded by adding 35-year-old Ilya Kovalchuk through free agency this offseason and was expected to make a renewed run for a Stanley Cup title with the likes 30-somethings Jonathan Quick, Drew Doughty (he’s actually just 28), Anze Kopitar, Jeff Carter, Dustin Brown, Trevor Lewis, Nate Thompson, Dion Phaneuf and Alec Martinez. The team was expecting some of their young players to step up, but players such as Tyler Toffoli and Tanner Pearson have struggled under Stevens’ tenure and haven’t developed into the goal scorers that everyone had hoped for. The team also has been without Quick, their star goaltender, for much of the season and there is no word on how much time he might miss with his most recent injury. Throw in the lack of development of some of their prospects and the team was heading down the wrong path with many of their veterans under contract for three of four more years. Desjardins, who has 20+ years of coaching experience, has been acting as Team Canada’s men’ head coach, including leading the team in the 2018 Olympic Games in Pyeongchang, Korea. He served as head coach of the Vancouver Canucks for three seasons between 2014 and 2017, compiling a disappointing 109-110-27 record. He also led Team Canada to gold at the Spengler Cup in December of 2017. Desjardins also served eight years as head coach in the WHL with the Medicine Hat Tigers where he won two championships in eight seasons there. The team also released fired assistant coach Don Nachbaur from his duties, who served as the team’s assistant since last season. The team has brought in current German National Team coach and former Kings player Marco Sturm. The team did retain assistant coach Dave Lowry. One has to wonder what Stevens chances will be to get another head coaching position. He served as head coach of the Philadelphia Flyers between 2006 through 2009, reaching the Eastern Conference finals once and a second playoff appearance. He has a combined record of 171-148-43. Helene Elliott was the first to report the coaching change. The Los Angeles Kings announced they have activated winger Dustin Brown off of LTIR Sunday and he is expected to make his season debut against the New York Rangers today. Brown’s return has come at a great time as the Kings have lost six in a row and sit at the bottom of the Pacific Division with a 2-7-1 record. Brown suffered a broken finger during a preseason game on Sept. 29 when he took a shot to his hand from teammate Anze Kopitar. The 33-year-old Brown is coming off one of his best seasons in a number of years after tallying 28 goals and a career-high 33 assists for a career-high 61 points. Brown has played 1,045 in Los Angeles, but the once consistent 20-goal scorer had failed to break the 20-goal plateau since the 2011-12 season. Regarless, the Kings signed him to an eight-year, $57MM deal ($5.875MM AAV) extension back in 2013, which looked to be one of their worst long-term deals until his big season a year ago. The team hopes it can get a boost with Brown back into the lineup. The team sent Michael Amadio back to the Ontario Reign of the AHL to make room on the roster for Brown. Amadio did get quite a bit of playing time for Los Angeles, playing in nine games. He averaged 11:07 of ATOI on the ice and had one goal. According to CapFriendly, the Kings have enough cap room to activate Brown off LTIR and after recalling goaltender Peter Budaj and sending Amadio down, the team still has $347K in projected cap space. As if the Toronto Maple Leafs and William Nylander negotiations weren’t getting enough attention, NHL.com’s Igor Eronko reports that KHL Avangard Omsk head coach Bob Hartley, whose team owns the KHL rights to Nylander, would love to have the winger come play for them. Negotiations between the two sides have not fared well with rumors that Nylander’s camp is asking for $8MM per season, while the Maple Leafs refuse to offer a record-breaking deal and are rumored to be closer to $6MM per season. An earlier report even suggests that Toronto’s latest offer was a four-year deal worth well under $20MM and the team is not interested in trading the 22-year-old. Nylander could opt to sign a deal with Avangard Omsk, although that seems unlikely as he’d prefer to play in the NHL, but obviously Nylander’s camp is hoping the possible threat of sitting out the season might bring up Toronto’s offer. The Ottawa Senators got another impressive performance from one of their young players Saturday when defenseman Ben Harpur finally made his season debut. The 23-year-old had been a healthy scratch up to now, but made an immediate physical impact to the game when he put a major hit on Los Angeles Kings winger Alex Iafallo early in the game. The 6-foot-6, 222-pound blueliner didn’t register a point in their 5-1 win over the Kings, but played so well, he led the team in ice time, playing 22:37, according to Don Brennan of The Ottawa Sun. Harpur was teamed with veteran Mark Borowiecki on a pairing assigned to shutdown the Kings’ top line of Anze Kopitar, Ilya Kovalchuk and Iafallo. That line finished with no points and just six shots on goal. The Athletic’s Jonas Siegel (subscription required) gives credit to general manager Kyle Dubas and the Toronto Maple Leafs for the signings of center Par Lindholm and defenseman Igor Ozhiganov, who both have made quite an impact on the Maple Leafs already loaded roster, giving them another two “free” additions on a team that needs as many cheap options as possible. Lindholm potted his first career NHL goal Saturday, while Ozhiganov had his best game yet, according to head coach Mike Babcock. The team has already done a good job in past years, bringing in foreign players on cheap deals, including defenseman Nikita Zaitsev as well as Calle Rosen and Andreas Borgman. The Los Angeles Kings will be without forward Dustin Brown indefinitely, according to the Los Angeles Times’ Helene Elliott as the team reports that he has broken his finger. The team released their own statement saying that Brown will miss the first portion of the season with the injury. Brown took a shot up high from teammate Anze Kopitar during the second period of Saturday night’s preseason game against Anaheim and left the game. The team later updated his situation by stating he suffered an upper-body injury. There is no word which finger has been broken. The injury is disappointing after Brown, who has played more than 1,000 games for the Kings, finally had a big season after signing an eight-year, $47MM extension back in 2013 after years of being a high-quality 20-goal scorer. However, since signing that deal, Brown struggled scoring goals, posting 15, 11, 11, 14 goals before finally breaking out with a 28-goal season last season. The 33-year-old has four more years on his contract at $5.88MM AAV and the team was counting on the veteran to continue making big contributions with the team aging quickly.